Jamba Juice Offering Almond Milk Based Smoothies! 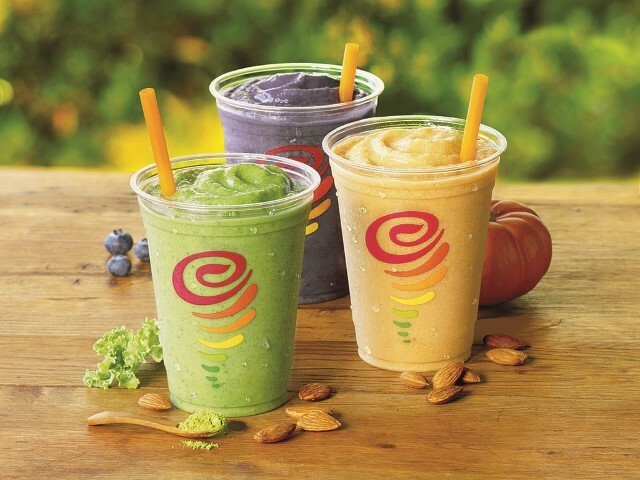 Jamba Juice, the popular restaurant chain specializing in smoothies/juices, is now offering almond milk-based smoothies in all of its stores nationwide! Jamba Juice is advertised and known as a healthier option for on-the-go meals and drinks, and they offer a wide selection of both. While they have technically offered vegan options in the past, they were simply filled with fruit for the most part, and many had fruit juice, not making them ideal as a healthy option. The inclusion of dairy-free alternatives such as almond milk is just a recent development, meaning those who are vegan or lactose-intolerant can also enjoy the creamy beverages offered. The options are said to have no artificial colors, make use of the entire fruit rather than just use the fruit juice and are being advertised as nutrient-packed. There is a good variety so far for those interested in trying them, and hopefully as the demand increases, so will the options! Currently, there is the ‘Peanut Butter & Berries’ option with peanut butter, berries, dates and almond milk. The second option is perfect for the fall and is the ‘Pumpkin’ smoothie, with real pumpkin, bananas, cinnamon, nutmeg, and almond milk. Finally there is the ‘Matcha Green Tea’ option, with Matcha green tea, bananas, kale, dates and of course some almond milk! It is great news for both vegans and those who are lactose intolerant in the United States, as Jamba Juice has over 800 locations nationwide. Advertising their chain as “better-for-you” foods and beverages, it seems this new initiative is perfectly in line with that.